I love bunkers. Let me say that again. I love bunkers! I never fear being in one because it's always a unique challenge to hit a good shot out of them. But with practice and the right fundamentals, it gets much much easier. I hope my enthusiasm for bunker play reaches you and that with some of the tips I am going to show you, you become a great bunker play. Or at least get out of the bunkers first time! Why are bunker shots so difficult? After playing golf with mostly mid to high handicappers throughout my 20 years on golf courses, the number one issue I see when guys struggle with bunkers is merely incorrect technique with lack of practice. With just the basics I want to show you below, you'll be able to get out of any bunker any time. 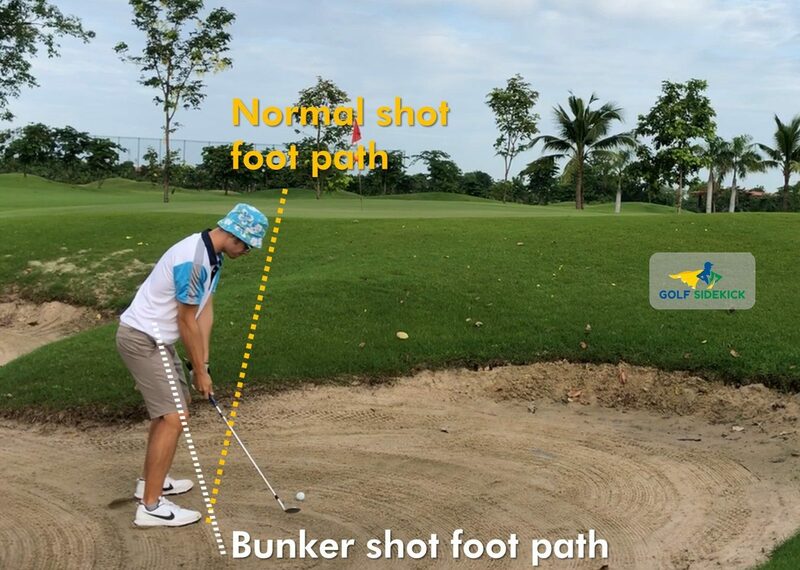 But we need to build that foundation of basics from the ground up so you can be more confident to start trying new shots and getting cute and fancy with bunker shots. DISCLAIMER: Bunker shot technique is tricky to start with and you'll feel really mentally blocked to be able to swing a club in the manner I present to you, but practice and losing that fear of failure will go a long way to building massive confidence. There is no way around it - practice and stick to the process. To get started, here is a video from my channel to show you the basic techniques I use. Below the video, I go into more detail regarding each shot. No theory and fluff here, let's get down to brass tacks. First, your main objective next to the green in a bunker is to GET OUT. You can always chip or putt from the fringe or even over the back of the green if you catch it a little thin. But we just DO NOT want another bunker shot from the same bunker. Not only is this frustrating because it's still in the sand, but you might roll back into your foot marks which makes it super difficult to get out on the next one. Add to that the embarrassment of staying in the sand and you're likely going to hit a bad shot. Your secondary objective is to get it anywhere on the green if you can. Even if you get it 3 feet out the bunker onto the fringe, you can still hole that putt or two putt it to save an acceptable score. When you move to next level ninja jedi bunker maestro, you can look at holing or putting bunker shots very close. For now let's get you OUT and ON THE GREEN. Your feet should aim to the left of your target in an obvious way. So your front foot should be pulled further back than a normal shot where your feet are lined up parallel with the target line. WHY? This encourages a stroke that cuts across the ball to help bounce the club off the sand and impart some back spin on the ball. Opening the club face means you can expose the sole of the club to let it enter the sand first. We don't want to enter the sand with the actual leading edge of the club because it will dig into the sand. We want to enter the sand an inch behind the ball and opening the club allows us to present the sole of the club to the sand first. The sole bounces off the sand and scoops under the ball, taking the ball out of the sand on a pillow of sand. Forward shaft lean means the hands are ahead of the club head and this encourages a downward strike on the ball. If we do this in a bunker, the club digs in and the ball will pop up momentarily and stay in the bunker. We want to get our hands in-line or behind the golf ball on a bunker shot to encourage an open face and expose that sole to the sand. This gives us a great chance to enter the sand and with the wrist action we are going to use, skim through the sand and get the ball airborne. 4. Loosen up them wrists! To release the club and get it under the ball and moving forward out of the sand, we need to take the club back and hinge hinge hinge the wrists. I like to get the feeling I am doing it with my right hand. Stiff wrists are a killer in green side bunkers because you can't release the club properly to get it to skim through the sand. With stiff wrists, you can either dig into the sand and duff it or skull it - either way not ideal. It's easy to get the jitters at the top of the swing and decelerate or stop the swing when entering the sand. What I would like you to work on, sir, is trying to slap that sand one inch behind the ball with the sole of the club and follow through to a full finish. This is a scary idea I understand, but if you try this at the practice facility, you will gain so much confidence. You'll probably hit some duffs and skulls to start with but within 20 or 30 balls, you''ll be able to get the ball out of the bunker first shot. KEY POINT: Slap the sand with the sole of the club using your right and and then follow through and feel like your right wrist is catching rain drops from above. 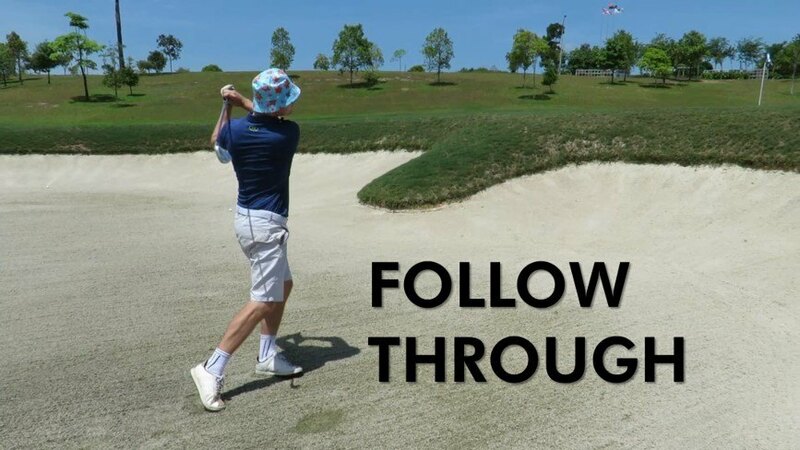 Your club head will often be ahead of the ball initially and that is exactly what you want. 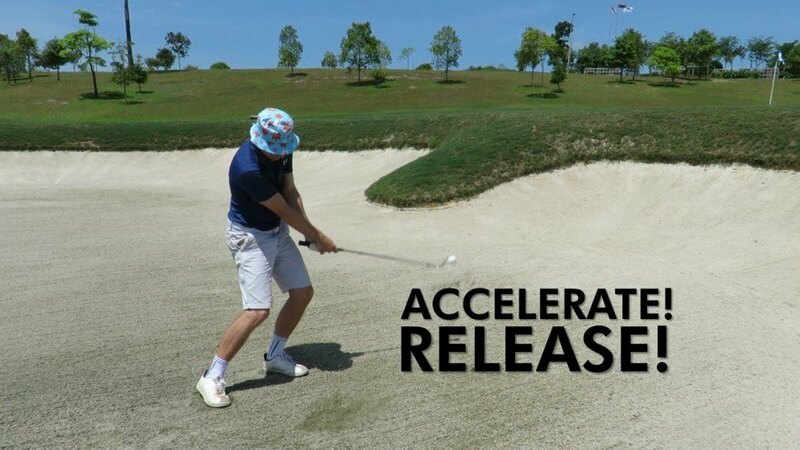 Accelerate through the impact zone all the way to the top of the swing. Hardly anyone will go to a practice bunker and work on these shots because they aren't very glamorous, but I tell you what guys, nothing impresses other golfers like the ability to get out of a green side bunker and put it to a foot. Get down to a green side bunker facility and draw a line behind the ball where you want to enter the sand. 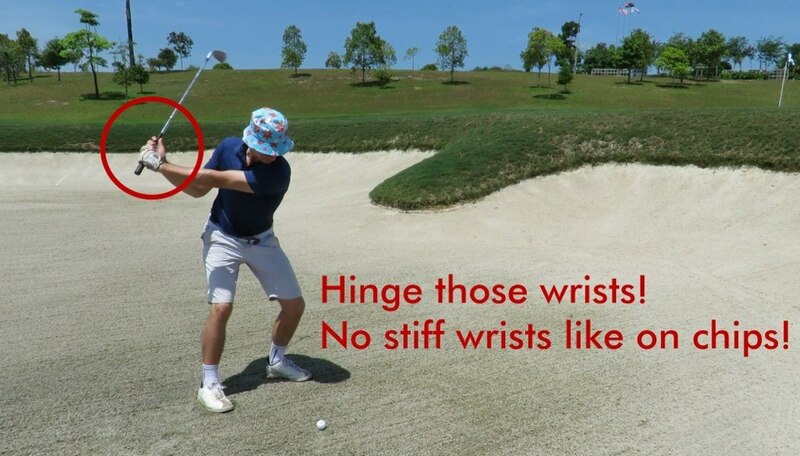 Remember to hinge your wrists on the way back and again on the way down after follow through. Slap that sand with the sole of the club using your right hand and finish your swing. My only other request is that you don't have anyone along your target line in the distance. You need a clear area so you feel free to make some mistakes when you teeth the ball - which will happen. But golf is a process not a destination so even when it feels like you're going nowhere, keep pushing and you'll come out the other side a better bunker player. I tried hitting before ball but it doesn't come out the bunker. Remember the backward shaft lean. 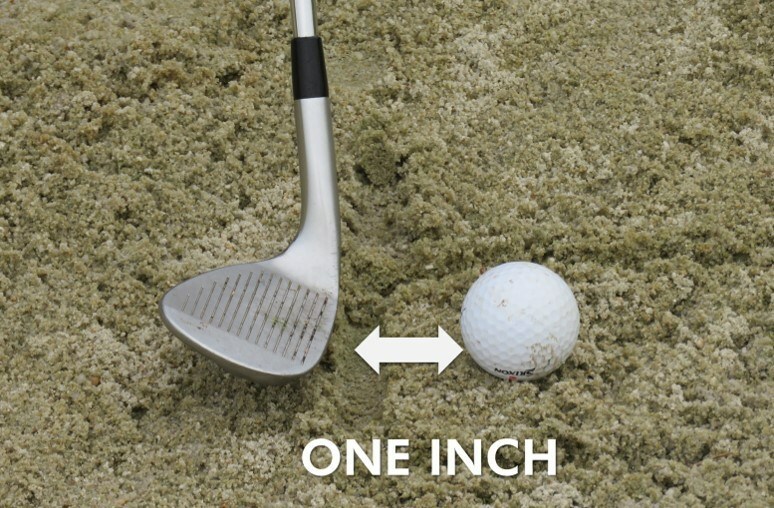 Remember to hit the sand ONE inch behind the ball - often people enter 4 or 5 inches behind it with the downward striking mindset. Check where you're entering the sand during practice and adjust and remember to hinge those wrists and slap the sand, not dig in! Check out my article on the best wedges for sand and start with a 56° if you're really unhappy in the bunkers. You can then start experimenting with the low wedge and gap wedge as you improve. But for a start a 56 degree sand wedge with 12 or 14 degrees of bounce will serve you well. If you play golf at a course with no sand in the bunkers, I am afraid you'll need to use a chipping technique as this technique above requires some sand to be in the bunkers. If your bunkers are truly horrendous, I would recommend joining another club or, more easily, avoiding the bunkers at all costs! But clipping the ball clean off the sand works so well! It probably works well 20% of the time. The technique above gets me up and down out of bunkers around 60% of the time. If the bunker lip is really low, putt it out. This works if your sand is not too fluffy and the lip of the bunker is pretty square with the sand and there's no big lip.